A teen's dream. 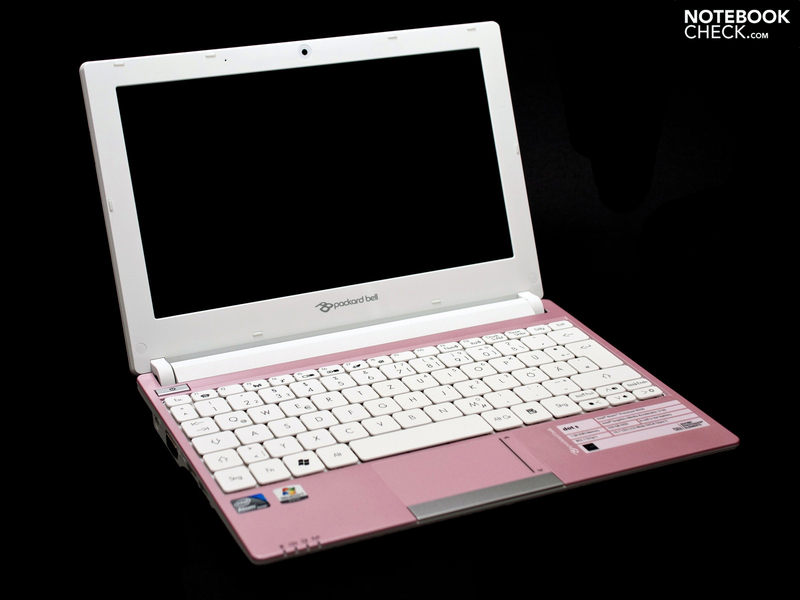 The Packard Bell dot SE netbook is a 10 inch netbook with an Intel Atom N550 dual core CPU that shows itself in sassy pink. 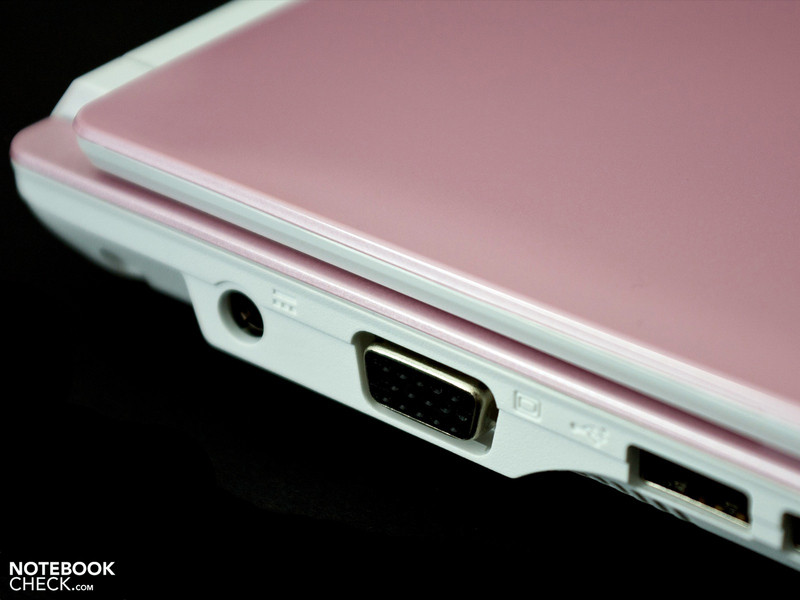 The well-known Aspire One chassis from the Taiwanese mother company Acer builds the basis for this device. 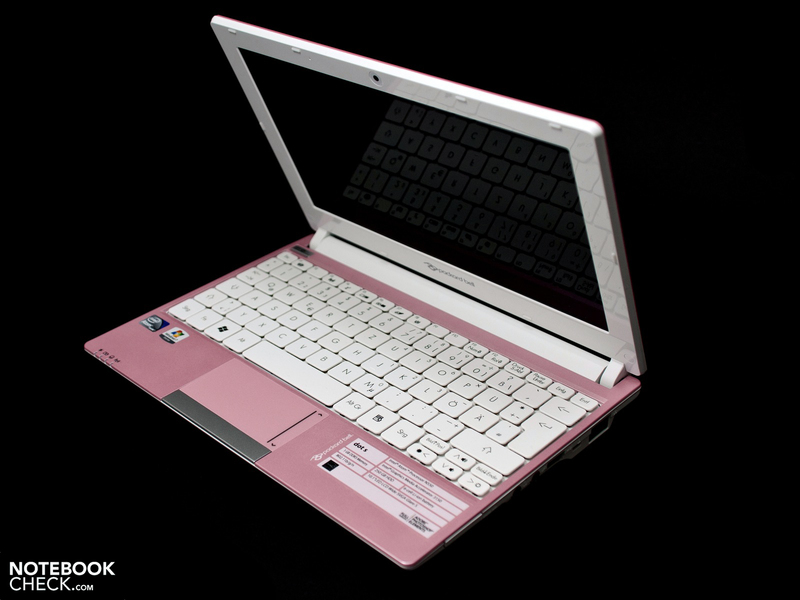 A toy netbook or reasonable hardware? We'll shed light on that. 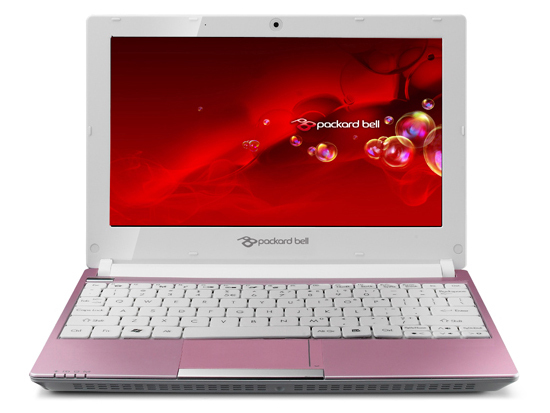 In addition to conventional laptops, you can find the netbook ranges, dot A with 11.6 inch screens and dot SE with 10 inch screens in the mobile sector of Packard Bell's portfolio. 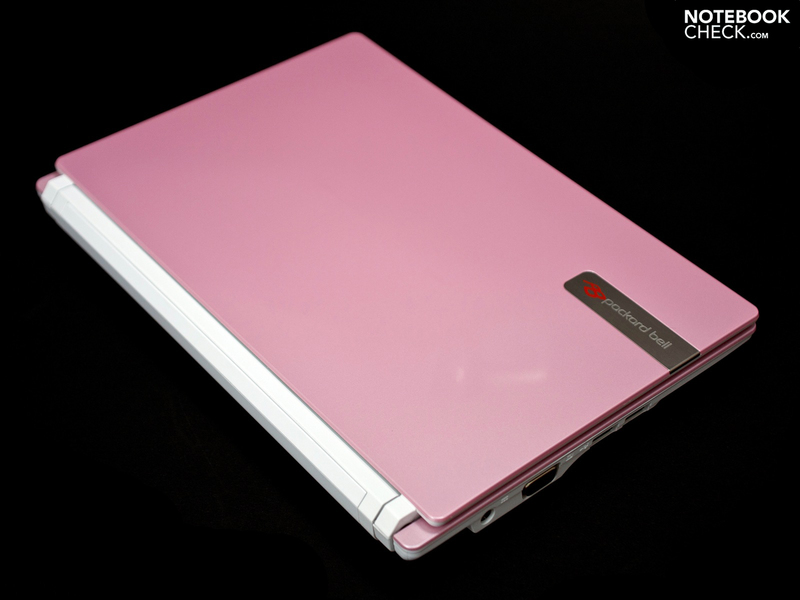 The latest state of the art netbook is called Packard Bell dot SE 045GE and is available in our unusual test color, pink, as well as red, black and white upon request. 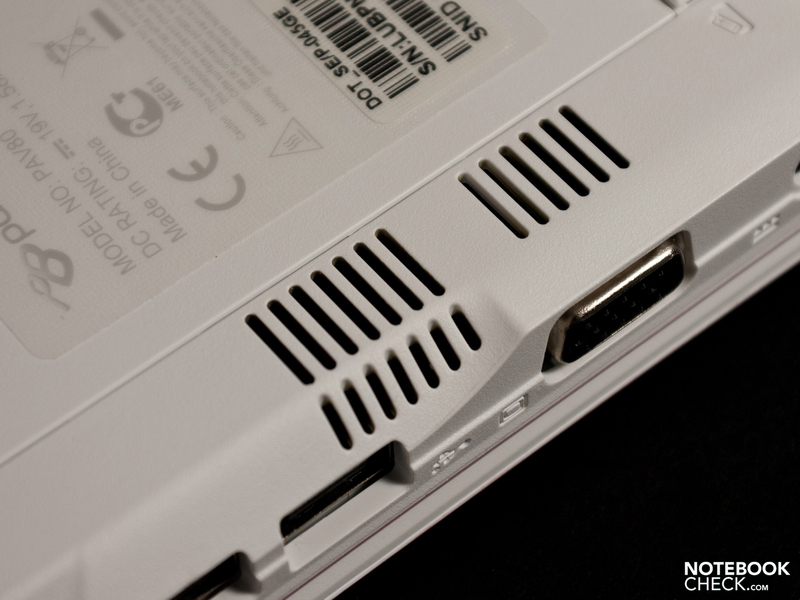 We will leave out the sections about case, connectivity and input devices in this review. 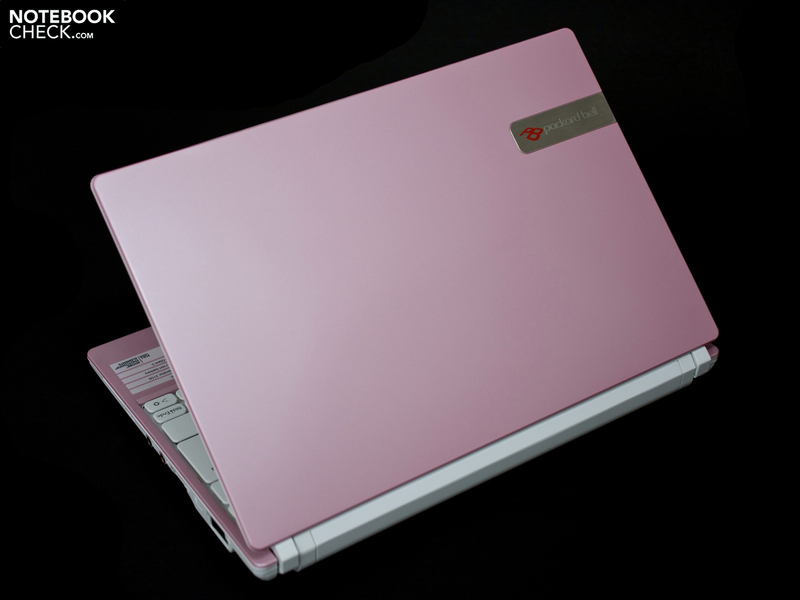 Packard Bell uses the well-known chassis of the Aspire One netbook range from Asus since its takeover in 2007. For example, Acer offers the Aspire One 521, the Aspire One D255 and the new Aspire One 522 with an AMD C-50 APU with minor modifications. The only additional point of criticism that should be mentioned is the weak looking display hinges that aren't well manufactured on the back of our test device. The display basically bids the typically used diagonal of 26 centimeters (10.1 inch). 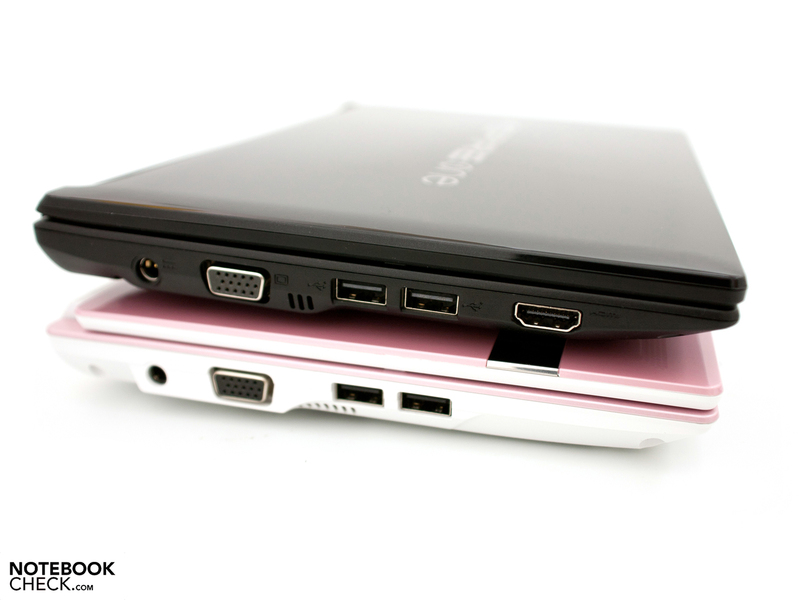 Even the resolution of 1024x600 pixels and the glossy surface is identical with the Aspire One counterparts. 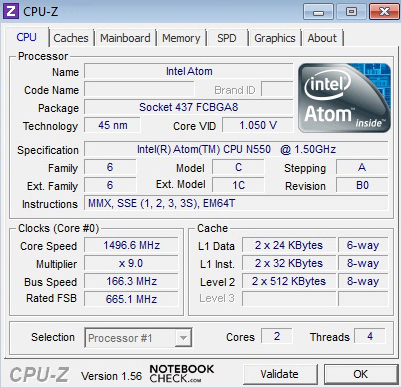 The latest Intel Atom N550 dual core processor does its job under the hood. It has a clock rate of 1.5 GHz (2 cores, 4 threads) and the incorporated GMA 3150 graphics unit. The standard 250 GB hard disk memory, a 1 GB RAM, WLAN standard 802.11 b/g/n, Bluetooth 3.0+HS and a 6 cell battery with 49 Wh also belong to the configuration. The device doesn't stand out of the crowd with a recommended retail price of 299 euros, including value added tax. The pre-installed Adobe Photoshop Elements 8.0 is a nice extra from Packard Bell. Packard Bell installs a 10.1 inch display into the entire dot SE range and our test model is no exception. 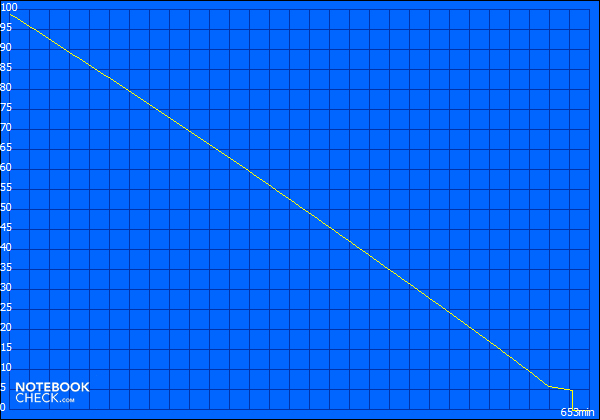 The native resolution is 1024x600 pixels in a 16:9 format. There is no option with a higher resolution available. Nor can higher (interpolated) resolutions be selected in Windows 7. 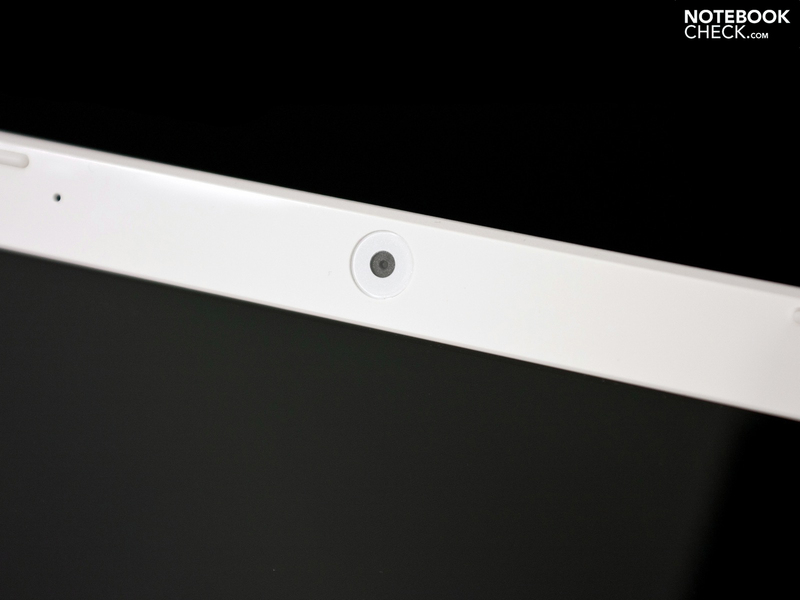 A drawback of the dot SE, as well as in the devices from Acer, is the high-gloss display surface (glare-type). The color reproduction is subjectively convincing due to an attractive brilliancy. On the other hand, outdoor use is impaired. 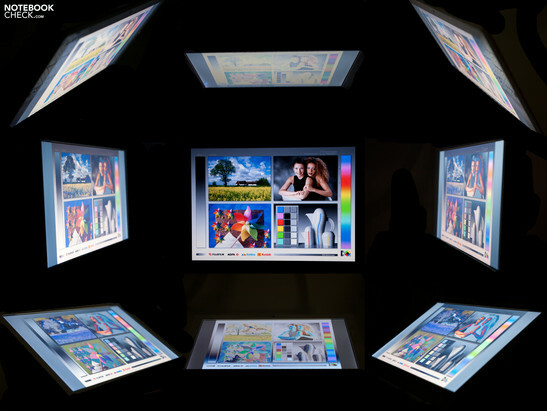 LEDs are responsible for illuminating the liquid crystals that allow the display's slim build at the same time. The maximum rate of 183 cd/m2 and the average of 172.1 cd/m2 are in the broad midfield of notebook displays. The Asus Eee PC R101 is, and will remain to be, the best of its class as well as a positive exception with rates beyond 300 cd/m2. The minor brightness fluctuation, which results in an illumination of a good 87 percent, has to be rated positively. The other rates of the AUO screen (model: AUO61D2) doesn't give any surprises. The increased black value of 1.83 cd/m2 provides a low contrast of weak 97:1 and makes black look slightly gray. The screen's ICC profile couldn't be read out. 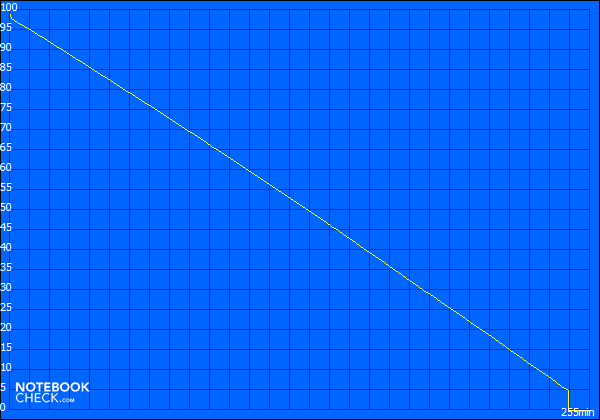 The reproducible color spectrum can be compared with this. It's very likely that the screen isn't suitable for professional use. Up until now, no netbook could come close to supplying this sRGB color gamut coverage. The screen looks good together with the glossy white display bezel, but outdoor use remains to be a vexing topic. The comparably weak illumination can't intercept the reflections outdoors. Working in a shady place is just still possible with a few restrictions. This is not the perfect combination in view of the approaching summer. The viewing angle stability is within the usual range. Horizontal rendering remains stable up to about 50 degrees in narrow angles. It doesn't look as good vertically. Merely a slight deviation from the ideal seating and viewing position provides for bleaching, respectively inverting of colors. 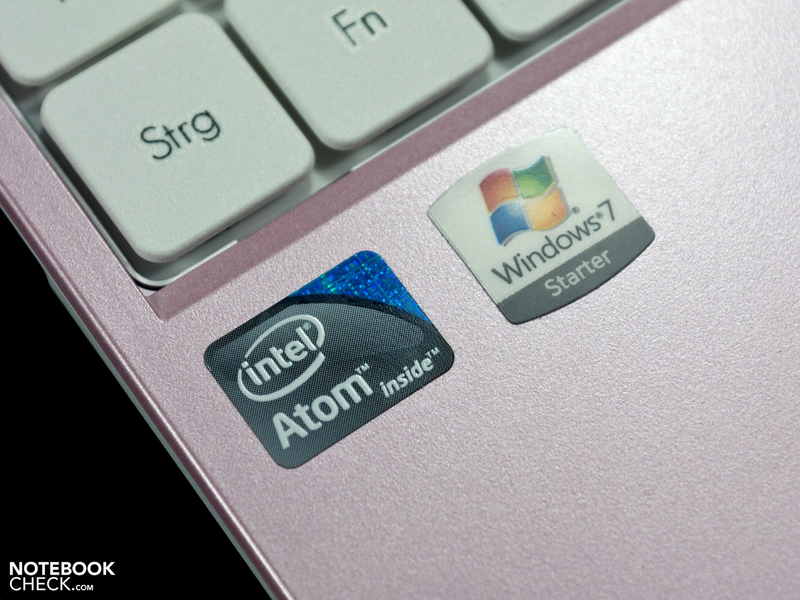 The latest Intel Atom N550 dual core processor is the dot SE's heart. It has a clock rate of 1.5 GHz (Pine Trail range). With support from the Hyper Threading technology, the physical computing cores are supported by two additional, virtual cores. 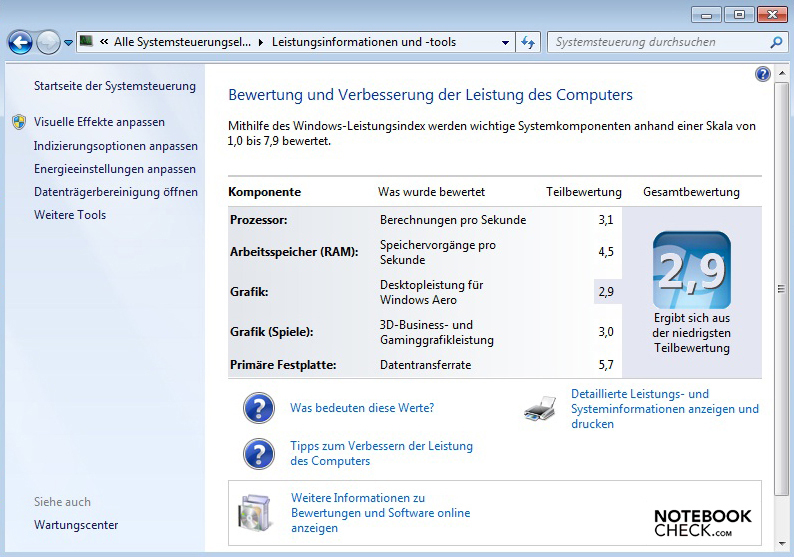 For mobility reasons, a dedicated graphics card isn't installed and the processor's graphics unit, Intel GMA 3150, is used. The GPU isn't suitable for current game tracks due to a core rate of only 200 MHz. Beside the combination of processor and graphics, there is a 2.5 inch hard disk and a 1 GB DDR3 RAM installed. Exchanging these components is possible with difficulty. 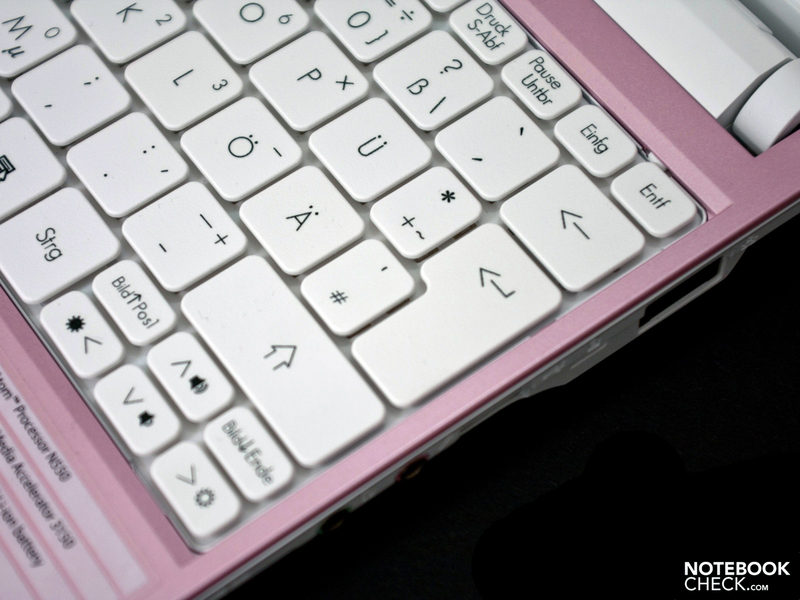 Alike the devices, Acer Aspire One D255 and Aspire One 522, the keyboard has to be unfastened and removed beforehand. After that, up to 2 GB can be used with Windows 7 Starter, respectively a 4 GB RAM with Windows Home Premium (keyword: software restrictions). The construction height of 9.5 millimeters has to be considered in case of a new memory medium. We checked the application performance with Cinebench and PCMark. The Packard Bell netbook is in familiar company with 1470 points in Cinebench R10's multi thread rendering. 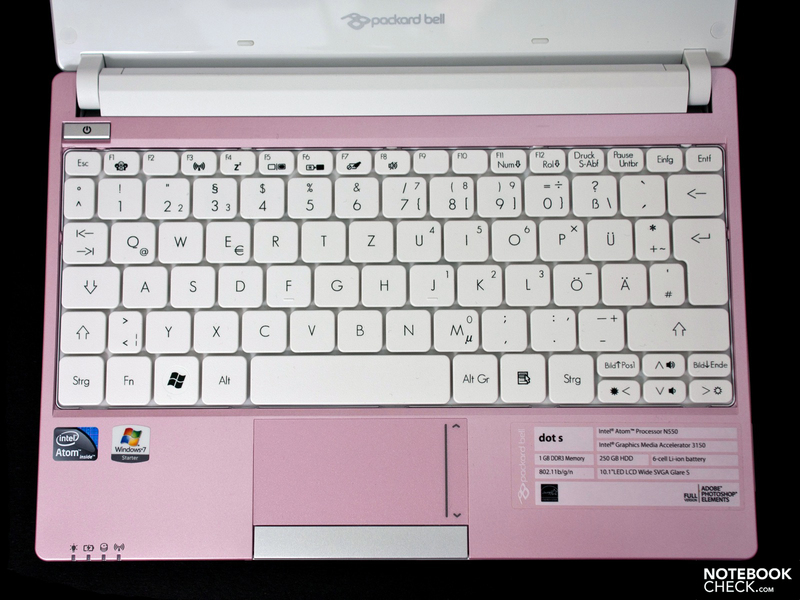 Among it, the Asus Eee PC 1015PEM or the Dell Inspiron duo Convertible. 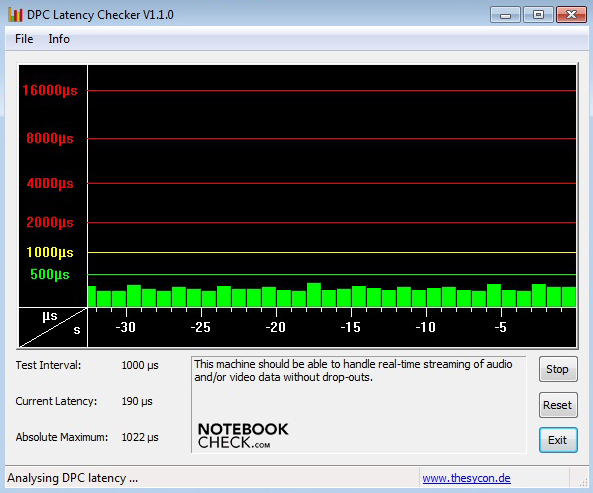 The system benchmark, PCMark Vantage, also records an average result for a netbook with this hardware. The Samsung NF210-HZ1 or Toshiba NB520, with high quality speakers, are found in the dot SE's (1636 points) immediate vicinity. The subjective impression is dimmed by longer booting times and a slower window build up. In comparison with AMD's direct opponent, the C-50 dual core APU with 1 GHz, the Intel Atom N550 nevertheless scores better on the whole. The lack of a HDMI out (with exception of devices with an ION 2 GPU) and the clearly poorer HD rendering without an additional decoder are drawbacks of the Intel N550, or rather Pine Trail range. 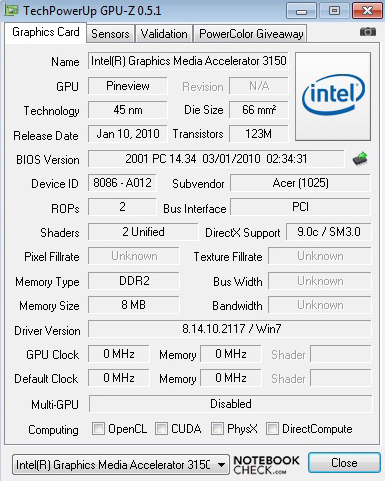 The GMA 3150 Graphics incorporated in the processor isn't made for 3D applications. This is confirmed by Futuremark's synthetic gaming benchmarks. The dot SE achieves 144 points in 3DMark 2006 in the total score and is thus located at the end of our database. Netbooks based on Intel Atom are in its vicinity. 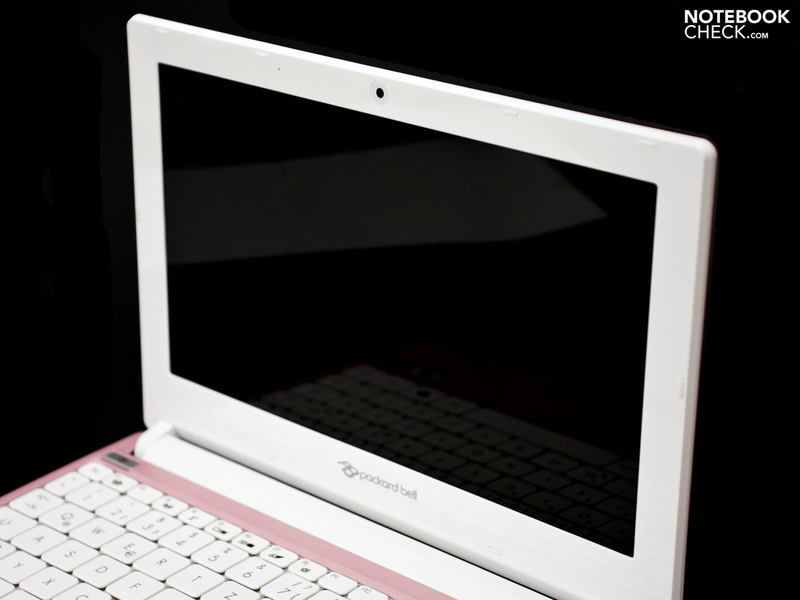 Among them, the Aspire One 532 with an older Atom N450, from the mother company Acer, for example. As expected, the 3D performance in games isn't convincing even in minimum settings and a smooth game play isn't possible. Packard Bell uses a Western Digital Scorpio Blue hard disk, with the model label WD2500BEVT-22A23, for the memory. The disk bids a capacity of, in the meantime, standard 250 GB at a maximum of 5400 revolutions per minute. 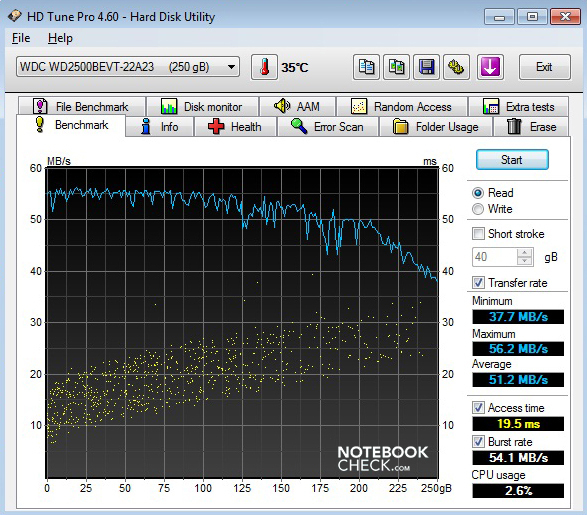 HDTune Pro and CrystalDiskMark record an average result. The transfer rates achieve rates between 56.2 and 66.9 MB per second at the peak. The access rate of 19.5 is also average. 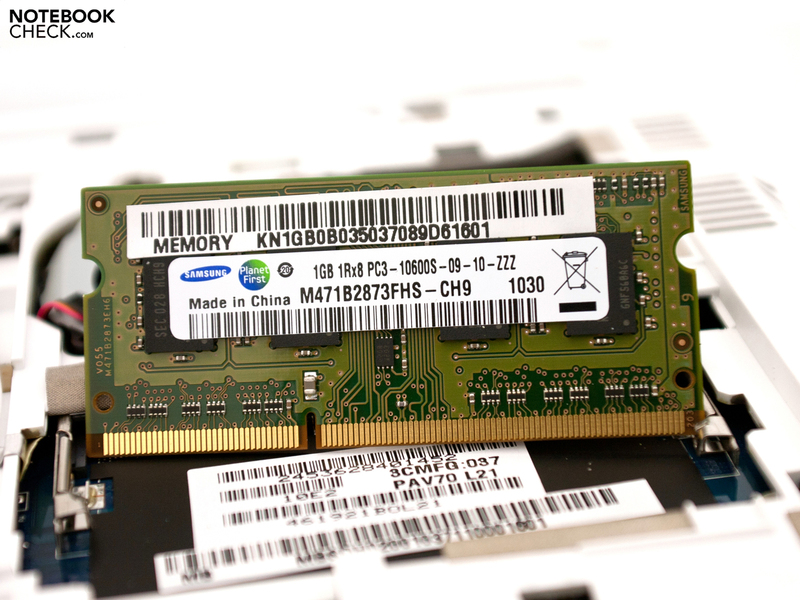 Thanks to the standardized SATA connector, fast hard disks, a hybrid disk or a modern solid state drive can be retrofitted. A little fan in the case's right is responsible for cooling the CPU. It remains unnoticed in the background with a maximum of 32.8 dB(A) in idle and doesn't interrupt working. 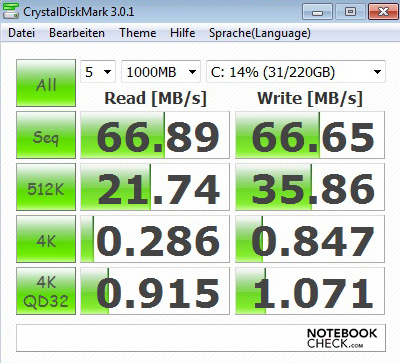 The integrated hard disk is surprising. It's even quieter than the fan in idle with a constant 31.3 dB(A). 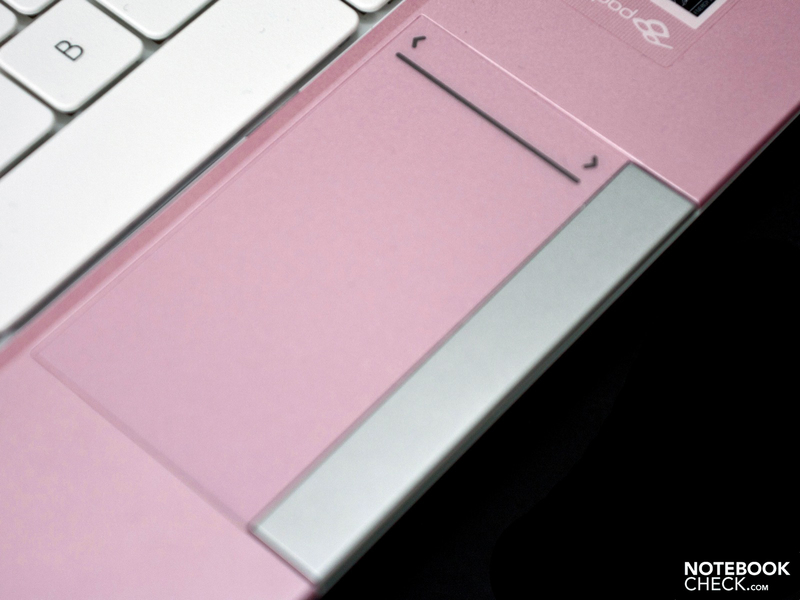 Even the vibrations caused by the hard disk are hardly felt on the case. The fan rotates faster during load and we can measure a maximum of 36.2 dB(A). This rate isn't irritating though. 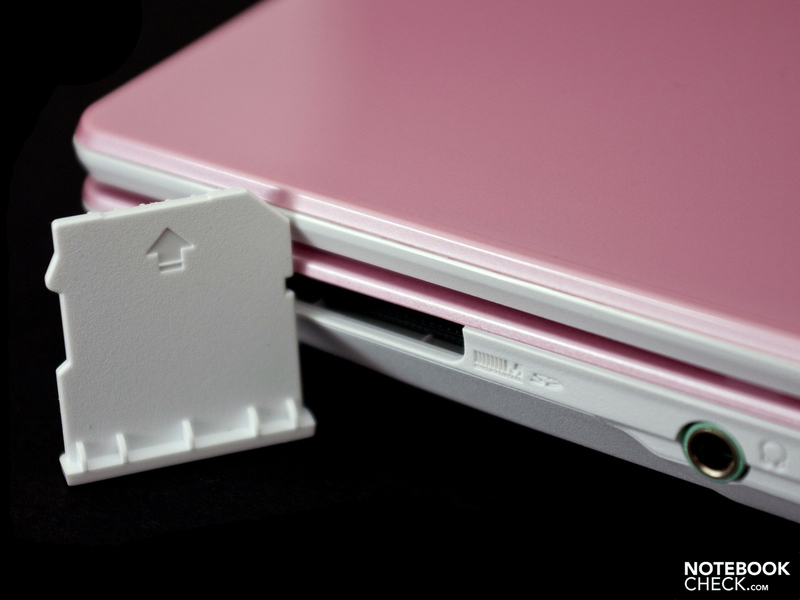 The particularly small ventilation slots for warm waste air are a constant reason for complaint of Acer's cases. This doesn't have an adverse effect in idle since the measured case temperatures of 28.1, respectively 31.5 degrees Celsius are within an acceptable range on the exterior. The peak rate during load (43.2 degrees Celsius) is found in the vents' area and is an indication for trapped air. The case's bottom heats up noticeably in this scenario. (+) The average temperature for the upper side under maximal load is 26.5 °C / 80 F, compared to the average of 29.8 °C / 86 F for the devices in the class Netbook. (+) The maximum temperature on the upper side is 31.8 °C / 89 F, compared to the average of 33 °C / 91 F, ranging from 21.6 to 53.2 °C for the class Netbook. (+) In idle usage, the average temperature for the upper side is 25.7 °C / 78 F, compared to the device average of 29.8 °C / 86 F.
(±) The average temperature of the palmrest area of similar devices was 29.3 °C / 84.7 F (+1 °C / 1.8 F). Two stereo speakers are responsible for the audio output. They are located beneath the case's front. The sound quality isn't anything special and the trebles protrude to the fore. The basses and low pitches are hardly present, so audio enjoyment just doesn't want to develop. Rendering via the installed 3.5 mm stereo jack is convincing and no static is noticed subjectively. Beside smaller power consumers, the Intel Atom N550 processor with the incorporated graphics (TDP: 8.5 watts) and the display need the most energy. 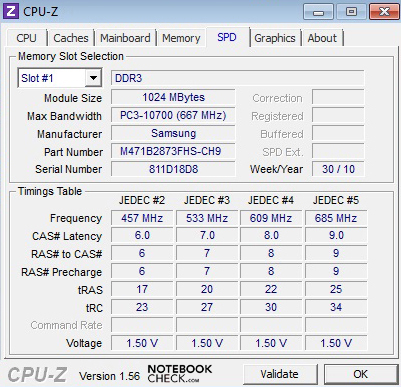 The CPU is convincing with low consumption rates in idle and we measure a maximum of 7.9 watts for the entire system. 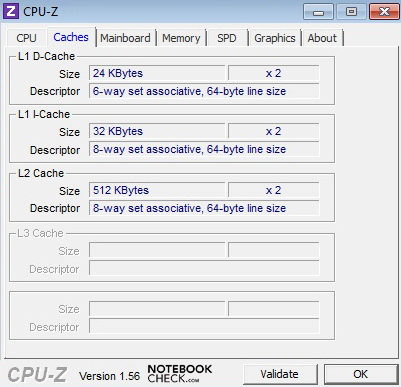 When the notebook is put under load, the components consume 14.6 watts at the peak. Intel's processor is convincing in comparison to the AMD C-50 APU. However, the weaker 3D performance and HD rendering should be considered. A 6 cell battery with a capacity of 49 watt hours (4400 mAh) serves as the power storage. 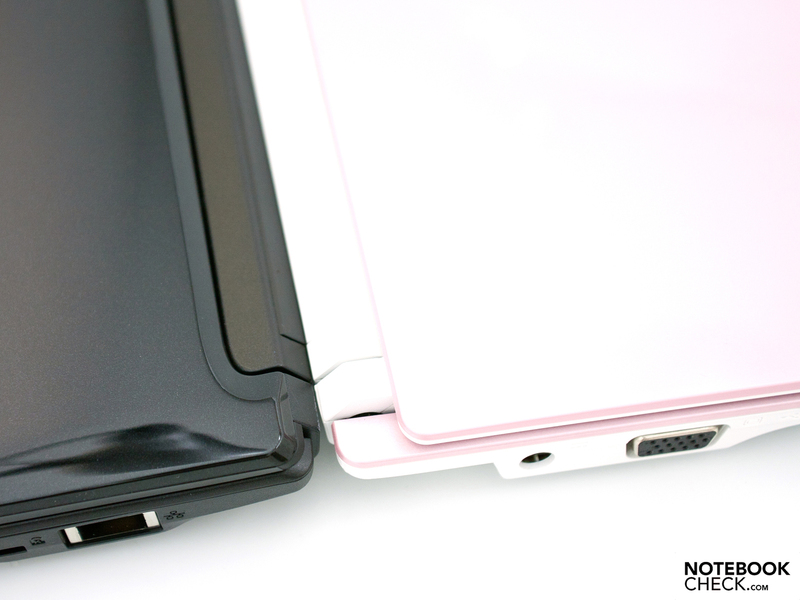 The flush case fitting on the rear and the low weight is an advantage over a high performance battery. We execute various battery runtime measurements with the "BatteryEater" tool. The Classic Test simulates an Open GL calculation with maximum display brightness, enabled WLAN connection and disabled energy saving functions (high performance profile). An external power source has to be visited after well 4 hours and 15 minutes. 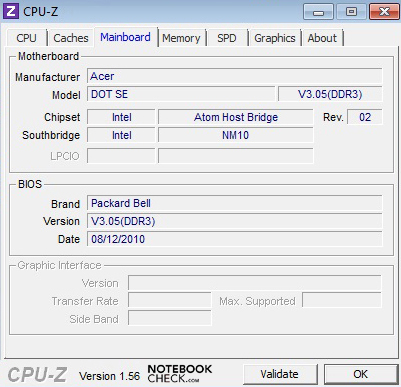 The Acer Aspire One 522, as the counterpart with AMD hardware, only achieves a runtime of 3 hours and 21 minutes in this assessment. In the realistic measurement, surfing via WLAN, the Packard Bell dot SE impresses with a runtime of 6 hours and 27 minutes in a pleasant, yet not maximum display brightness. The Acer Aspire One D255 with an identical configuration bids almost exactly the same battery life with minor measurement differences. The last assessment is the Reader's Test. Here, reading a text document in minimum (not disabled) display brightness, disabled wireless technologies and enabled energy saving functions is executed. A complete battery charge is used up after a good 10 hours and 53 minutes. The summarizing assessment of the Packard Bell dot SE is not really easy. The case comes from the mother company, Acer, and doesn't have any surprises for us and attentive readers. 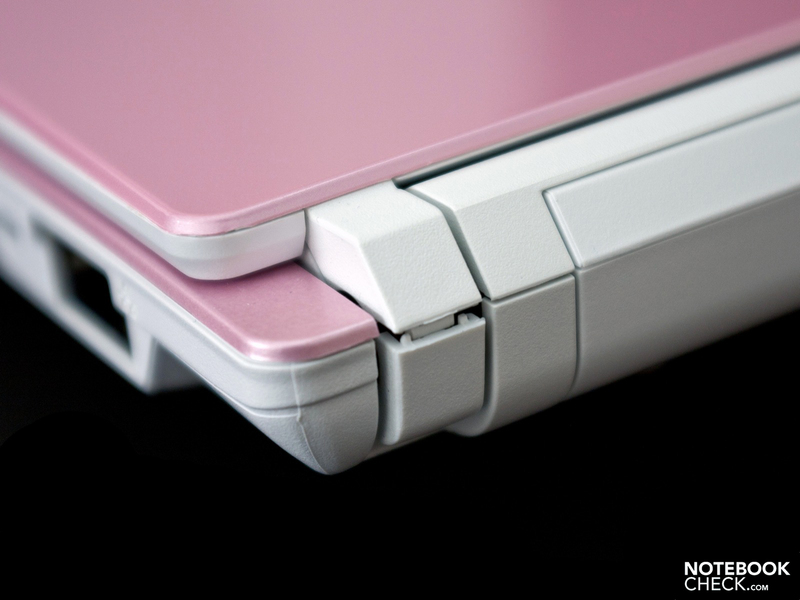 The pink and white color of our test device is a matter of taste. The workmanship is impressive with exception of the display hinges. Nothing has been modified in terms of input devices, connectivity or other equipment, either. 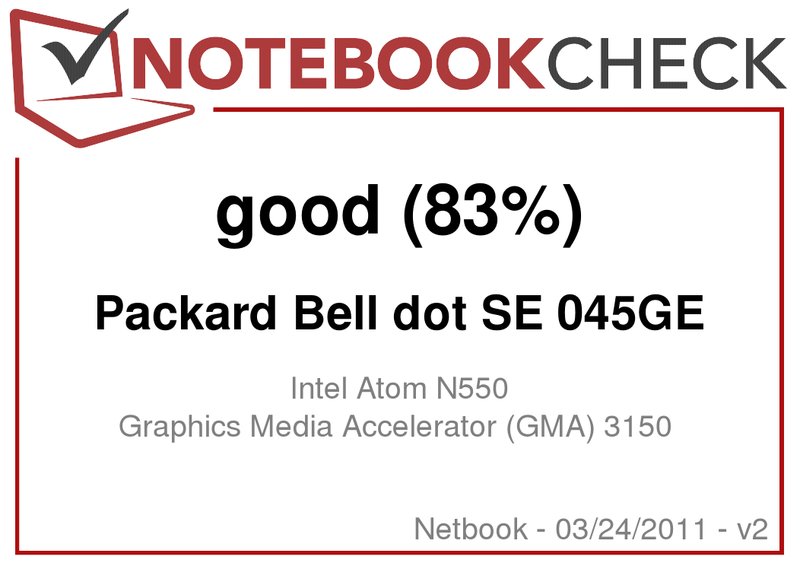 The installed Intel Atom N550 convinces with an acceptable office performance, although there is still a lot of room for improvement. Another advantage of the system is low consumption rates, the long battery life and the quiet interior fan. The high-gloss display fits perfectly in the white dot SE's image, but the ergonomics suffers under the surface and the average assessments. The pre-installed full version of Adobe Photoshop Elements 8 is a nice addition from Packard Bell. In view of the fact that this netbook only represents just another sales channel for Acer, without offering new features or functions, dims the picture a bit. Especially if you consider that the recommended retail price of 299 euros doesn't contribute a value for money advantage in face of equally configured devices. 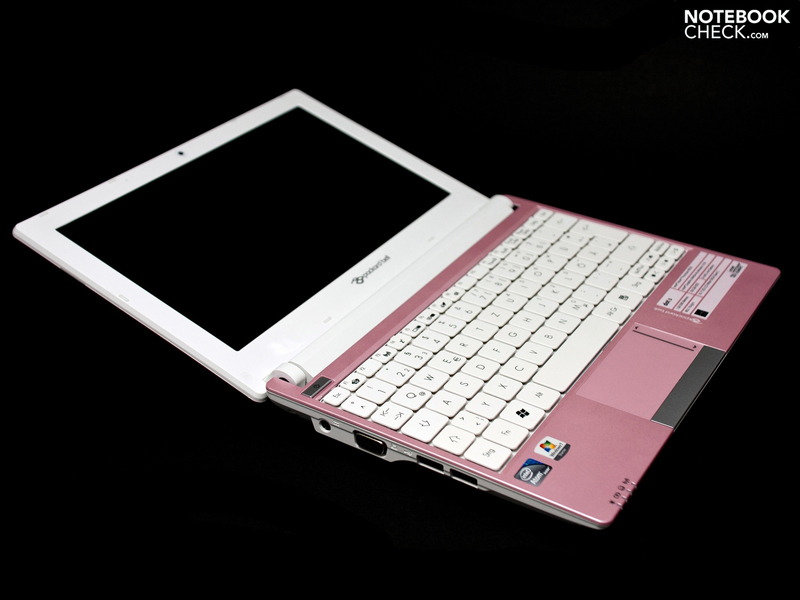 The good battery life and consumption rates as well as the netbook's low total weight. 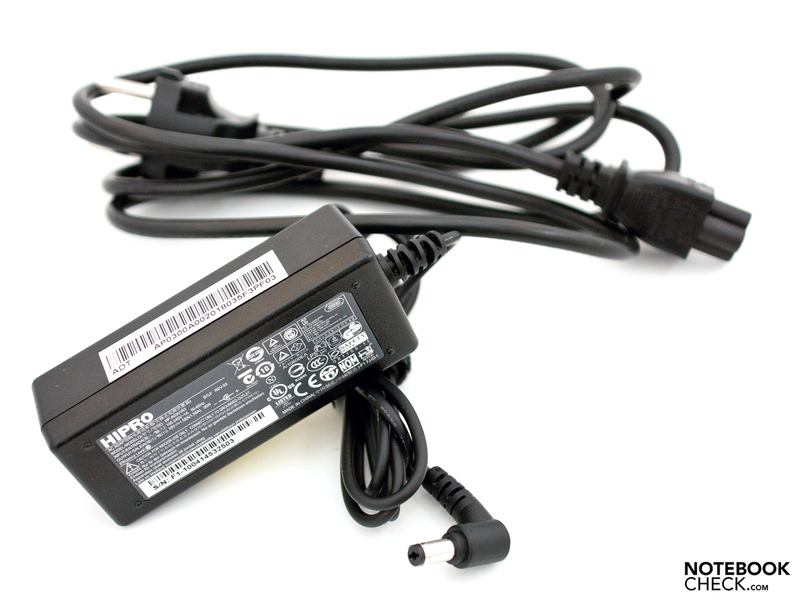 The practical power adapter with exchangeable plugs from Acer and a better, matt 10.1 inch display. 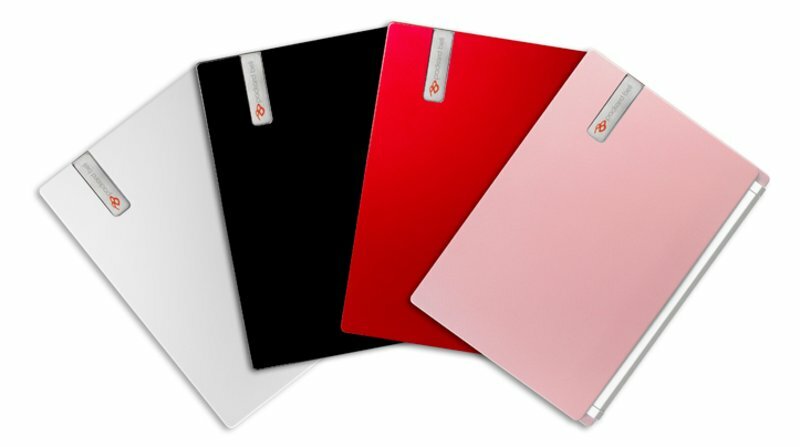 Acer's use of the Aspire One series without offering purchase decisive (new) functions or features. For example, the Acer Aspire One D255 with a slightly modified design, the Asus Eee PC 1015PEM, the Samsung NC210 or the Toshiba NB550D Netbook with higher quality speakers and AMD hardware.